Hawthorne is probably best known for the novel, The Scarlet Letter, but many readers also know him for his short stories and sketches, a number of which are featured in literary anthologies. 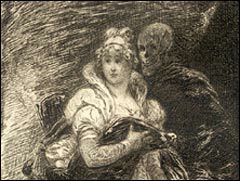 These anthologies seem to publish the same few stories, however: "Young Goodman Brown," "The Minister's Black Veil," "Rappaccini's Daughter," "The Birth-mark," "The Artist of the Beautiful," "My Kinsman, Major Molineaux," "The Custom House Sketch,"and, less often, "The May-pole of Merry Mount," "Roger Malvin's Burial," and "Ethan Brand." Hawthorne wrote over 100 short stories and sketches, however. Sixteen of these are uncollected stories; the rest are in three collections: Twice-told Tales, Mosses from an Old Manse, and The Snow Image and Other Twice-told Tales. This website includes information on some of Hawthorne's lesser known stories as well as on those that are frequently anthologized.